Sometimes I struggle with making decisions. For many years, I even needed several opinions on what to wear each day before settling on an outfit. When it comes to bigger decisions? I pull out all the stops, creating pros vs. cons lists, surveying every friend/relative that I think won’t tell the other I already asked them, and struggling internally until I often just flip a coin to make the choice or collapse wondering how I will ever choooooooosssee. Picking an option, especially when it can have far reaching consequences in your life, can be hard. And finally, as apple products have trained me to think, there’s an app for that. In this case, it’s a free web tool created by Ben Gimpert. He’s calling it Something Pop, and it’s the result of a hobby (a pretty useful one, I might add). 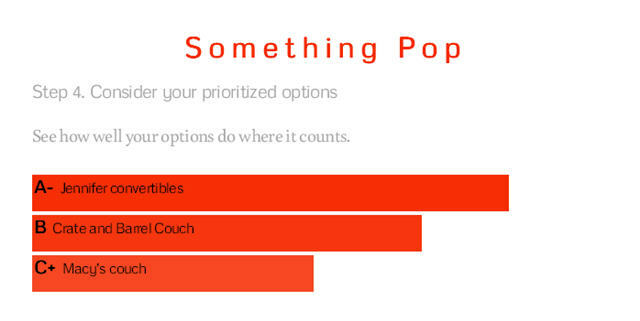 It’s motto is that it helps you make better decisions by making your priorities pop. Basically how it works is that it quantifies everything that you list as important to the decision to provide a mathematical, objective outlay of which is the actual best decision, not just the decision you bullied your best friend into telling you was the right one. There are big categories already entered for you like, which job to take, which apartment to rent/buy, which city to move to, leaving academia, but then there is the more ambiguous choice of “something else” that you’re deciding, like which kind of couch to buy. I know I agonized over that choice this past summer. Once you know the decision you have to make, you input your priorities. In the case of my couch, I was looking at color, price, softness, and removable cushions. You give each a percentage rating of how important it is to you. Then, step two is listing all the options available. There’s the couch at Macy’s, Jennifer Convertibles, and my dream Crate and Barrel couch. Each field has prompts in case you’re unsure of what to add. Step three is to rank how your options stack up against the priorities you set on a D- through A+ scale. In my case, I would need to see if the color is right at Macy’s, but the price was WAY TOO HIGH at Crate and Barrel. Then they make you a chart that averages how your couch stacks up. Thought the Crate and Barrel couch was a dream come true, it got a D- on affordability (an important priority), and thus, ranked below the couch I actually ended up buying. It’s a list-maker’s dream. Input all the variables you want, and then look at how they rate. The charts don’t lie. 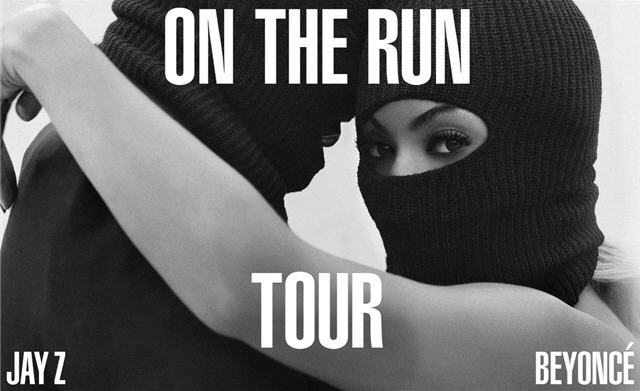 I get to see Beyonce perform with Jay Z during the On the Run tour this summer. I could not BE more excited!! Living in NYC, I see a ton of cyclists biking to work every morning, and home again every night. Since the launch of citibike, I have noticed even more. I see bikers do lots of risky things, like go the wrong way down one way streets, text while biking, and swerve in and out of traffic, but the most dangerous thing? Most of them don’t have helmets on. I’m too scared to ride with traffic in a big city, so I only bike on the paths closed to car traffic, and I know that when I do that I always feel pretty nerdy putting on a helmet. It’s not the cutest look, and it really messes up your hair. But it seems pretty risky to go without one when there are so many hazards (I’m talking cab doors here) that can pop out of the crosswalk, into your bike lane, and toss you from your bicycle. If we’re being serious here, messed up hair is no good reason to skip it – my hair gets pretty tousled by the wind even when I walk to work sans helmet. That’s what purse sized fold-up brushes are for. Now (in Europe at least), there is a solution for the vain cyclist that will protect the coif and the noggin in case of an accident. It’s called the Hövding device, and it’s an inflatable nylon collar that bikers can wear inconspicuously. It only pops open when it senses an accident, similar to the air bags in your car (the future is here, guys!). The device has been in development since 2005, and has tested simulations of all types of accidents from icy roads to being hit by a vehicle. When the accident occurs a tiny gas canister at the back of the collar pops the collar open into a full-coverage helmet in milliseconds. It even stays inflated for several seconds before deflating to cushion any additional impacts. It retails online for 399 euros (about $536), and is available in several colors and designs to make the collar even more fashionable. More expensive than your average helmet? Sure, but can you really put a price on staying safe, feeling cool, and having good hair? Currently it’s only available in Europe, so now you know what to buy on a souvenir on your next vacation! I would love to own this beautiful Ted Baker rain coat for all of these April showers. If you ever noticed those men who seemed, well, slightly older than college age lurking along the edges of the club in Acapulco – now you know who those adults crashing your spring break were. As I enter my last year of my 20’s, I will spend my time half-seriously considering those living social botox deals, and then remembering that 30 is the new 20 for all of these fun reasons. I have a pretty sensitive sense of smell, and I tend to associate certain smells with certain people or times in my life. I love the idea of these scents that represent the states in America. One pretty funny blogger’s take on liking (and often not liking) your job. Naturally Whitney Houston should be paired with a rose wine. Find out how music and drinks go together. If you love music festivals, you’ll want to check out this list of which ones are going on, and when they’re happening. Just when you thought you had enough to deal with, science has discovered 15 new emotions. It seems that single mothers may actually be better off staying single than marrying a dud. It’s Thursday, or as some people think of it, Thirsty Thursday- a pretty popular night to go out, and get a jump on the upcoming weekend. If you are looking for a good excuse to skip happy hour (other than your Netflix queue), check out the Drinking Mirror app. It will show you the future ruddiness, sagginess, and over-all blah-ness of your skin after years of alcohol consumption at your typical rate. This app offers you a look at Christmas Future, to see if that extra shot is really worth its consequences for your face!